Ecola State Park is a very popular spot to visit, especially if you live near Portland, OR. Almost a straight shot west from Portland on Highway 26 Ecola State Park offers a wide variety of activities. Turn left just after entering the park for Crescent Beach access. Here you will find a nice spot to picnic and enjoy breathtaking views. Turn right for easier beach access at Indian Beach. 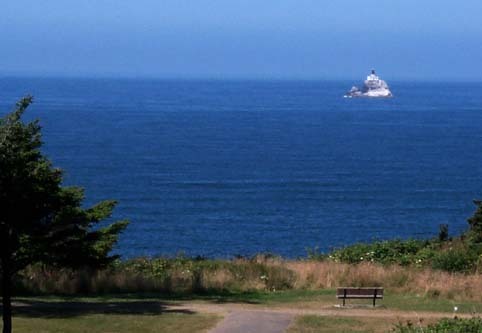 Hiking trails up the coastal bluffs give you better views of Tillamook Rock Lighthouse. There are lots of picnic tables but on the weekends things can be a bit crowded so bring a blanket on which to sit. A short walk from the parking lot, a well paved trail, will take you out the viewpoint where the picture of Sea Lion Rock was taken. This is a prime spot for whale watching. If you forget your own binoculars the park has provided some coin (quarter) activated viewers. Trails lead from the parking area down to the sandy beaches below. The trails can be steep and footing unsure on loose rocky ground. A short one mile drive from the park entrance, on a narrow winding road, is Indian Beach. Here you will find easy beach access a few yards from the parking area. Lots of water addicts come here to swim, surf and just plain enjoy the sun. If hiking is your thing you can hike north along the coastal bluffs for less than a mile and look STRAIGHT down to the ocean and beaches below. 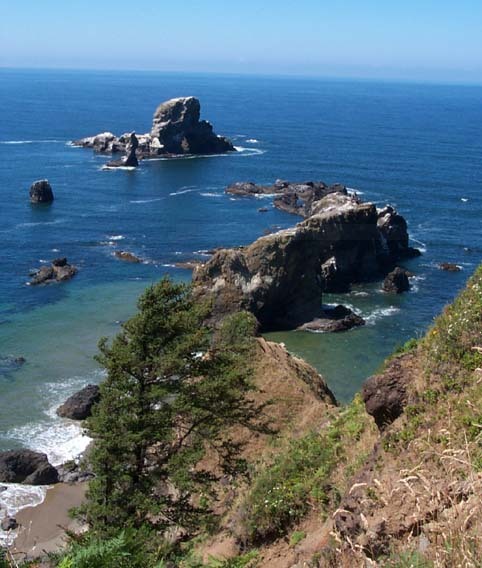 There are several looping points, or if a long hike is what you’re looking for, the full six miles to Seaside, OR., will give you a great workout. This six mile trail was thought to have been originally hiked by Louis and Clark while locating Native American tribes to trade with for supplies. Ecola State Park is located just north of Cannon Beach, OR. Highway 101 will give you your easiest access to the Cannon Beach. A slow but short drive through a villa of tourist traps winds through town on your way to the park.